A Restricted Executive Bonus plan funded with life insurance offers a hybrid arrangement that bridges the gap between a deferred compensation plan and a regular executive bonus plan. These plans are a great benefit for a company to offer to non-owner key executives to retain and reward them for their valuable services. A) An employer may like the benefit control afforded by a Deferred Comp plan with a company owned life insurance policy to informally fund the agreement and a vesting schedule in the deferred comp agreement. But, the employer may object to the non-deductibility of deferred amounts and premium payments for tax accounting purpose. Also, the employer may object to the booking of the deferred comp liability on the company balance sheet for GAAP and FASB purposes. 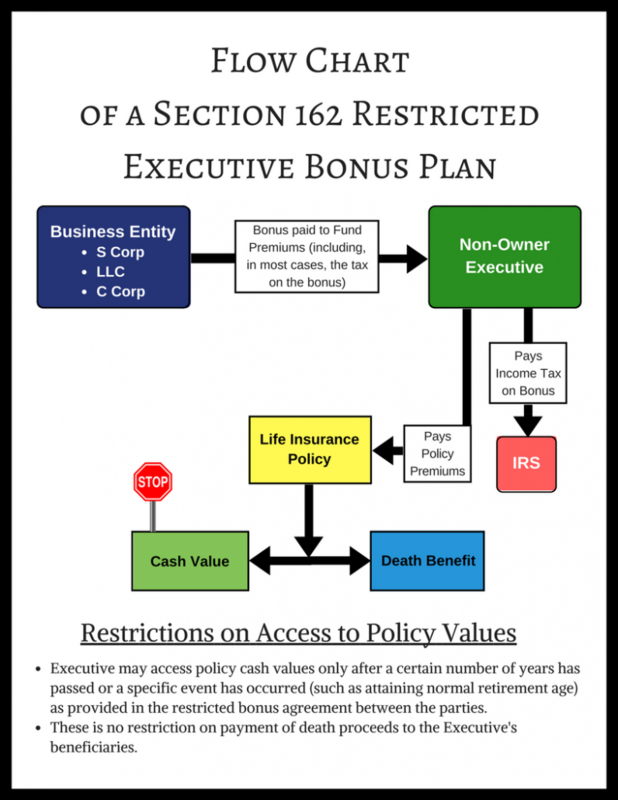 B) Conversely, a regular Executive Bonus plan provides a current deduction to the company (IRC Section 162) and current taxation to the executive. However, the corporation has no control over the bonus once it has been paid to the executive in the form of a premium for personally owned insurance policy. Also, the executive can leave the company for other employment at any time with no loss of the benefits (i.e. policy cash value) on bonuses already received. The insurance proposal can show a tax free solve income stream from policy cash values via withdrawals to cost basis, then switching to policy loans (FIFO). For example, the tax free policy income stream may be shown from retirement age 65 to age 85. The death benefit remains income tax free to the personal beneficiary of the insured executive. The restricted bonus plan is especially attractive in an S Corp case. Since an S Corp is a pass-through entity to the S Corp owner for tax purposes, the non-deductible deferrals of a deferred comp plan would flow through as part of the K-1 pass-through profit to the S Corp owner personally on Schedule E of his Form 1040 U.S. Income Tax return. In essence, the S Corp owner would be using his own personal after-tax dollars to fund the deferred comp benefit of his non-owner key executive. The restricted bonus plan avoids this K-1 accounting problem. The bonuses are currently deductible to the corporation and currently taxable to the executive as earned income compensation. Since the benefits of a restricted bonus plan are subject to a risk of forfeiture if the executive terminates employment during the vesting period, the executive can make an IRC Section 83(b) election to have the bonuses taxed currently despite the risk of forfeiture. Contact your BSMG Life Advisor to discuss whether a Restricted Executive Bonus plan can work for your business owner client’s key executives. BSMG has access to a wide array of cash accumulation type of life insurance products from competitive carriers.